Southern California and San Diego has been described as the birthplace of the diving industry. Since 1971 we have been at the forefront of this industry leading extraordinary scuba expeditions and liveaboard dive charters to the Channel Islands, Baja, Guadalupe Island and beyond. Founded by the husband and wife team of Lou and Sandy Grivetto, the Horizon Charters of today only slightly resembles the original version. Our commitment to diver safety and environmental protection are hallmarks of the company today. Exploration and adventure lead us in 2000 to be the first commercial liveaboard company to introduce liveaboard shark cage diving at Isla Guadalupe in Mexico, an event that fundamentally changed the way the world views, interacts, and cage dives with great white sharks. Join America’s Shark Boat for your next liveaboard scuba expedition in Southern California and beyond. Our vessel history and company DNA sets us apart from any other vessel in the region. We’re the liveaboard vessel you call home, and the dive crews you’ll soon call friends. Isla Guadalupe great white shark diving is a liveaboard charter for Isla Guadalupe in Mexico. It is ideal for Shark diving|Great white sharks|Cage diving|Liveaboard diving|. America’s Shark Boats humble beginning started in 1971 with the 46′ fishing vessel named ‘Alicia’. Working together onboard the boat, Lou at the helm and Sandy serving up fine food to hungry fisherman, Alicia was primarily utilized for overnight sportfishing excursions to the fish rich grounds off of the coast of Southern California and Northern Baja, Mexico. Amazingly enough, Alicia is still in service for a different sportfishing company in San Diego, located at H and M Landing where we tie up our vessels. The winds of change were in the air and opportunity was calling. A new 65′ fishing vessel ‘Horizon’, and Horizon Charters started to take shape. Scuba diving was added in 1982 with 3-tank and overnight trips to the local Coronado Islands, Point Loma Kelp Beds and San Clemente Island. In 1980, a two day weekend trip was a long live aboard affair. The first long range live aboard dive adventure into Baja came in 1985. The Horizon ventured south to Isla San Martin and visited the offshore pinnacle of Ben’s Rock. In 1989, after 10 successful years onboard the 65-foot Horizon, it was time to expand. A beautiful 80-foot vessel had recently joined the San Diego fishing fleet and was up for sale. With the new larger, more comfortable Horizon, the future was clearer than ever! That same year Horizon made the first exploratory excursion to Islas San Benito to investigate possible future dive destinations. What we found on that trip was a pristine marine environment that was so diverse that we made the decision on the spot to start offering live aboard adventures to this destination. Few divers had ever been to the Baja coast and offshore islands. We wanted to show the world what we’d found and within two years were offering trips to Isla San Benito, Isla Guadalupe and other points south. Due to that years El Nino event, Numerous tropical species were witnessed out of range and one very rare rockfish was captured. One of only two to have been captured up to that point. The information gathered on this venture was also shared with the Mexican fisheries department as Mexico had two representatives from its Fish and Game department onboard. Late summer of 2000 brought many changes to the way we all looked at white sharks in the Pacific. 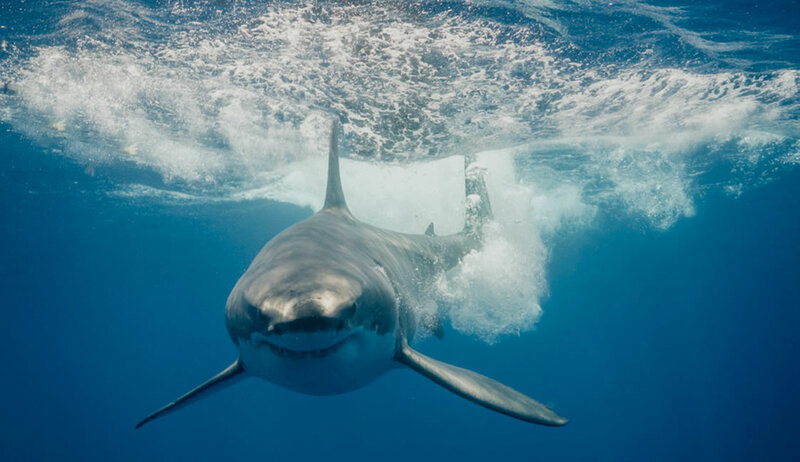 With word that white sharks had been seen at Guadalupe Island the Horizon made the first ever cage diving expedition to the island. What we discovered there changed global cage diving with great whites forever and opened this location to the world. Our second cage diving season at Guadalupe Island was rocked by tragedy. On that fateful September day all of America was glued to the events taking place in New York City, but we were glued to the events that were taking place in front of our own bubbly eyes at Guadalupe Island. Great white sharks, in great numbers had moved in, and we were at the forefront of exploration. The era of great white shark cage diving had arrived with our second season at the island. We visited Guadalupe Island three more times that fall in search of the mighty great white and were amazed to find these animals willing to allow us to witness their beauty on every occasion. Something unheard of in other parts of the world. With that second season (all to ourselves) Horizon Charters was the first commercial liveaboard company to introduce eco-tour liveaboard shark diving to Isla Guadalupe. We feel lucky to have been there first and will always savor that moment when the first shark arrived to our amazement. His name became legend in the cage diving community and we named him ‘Shredder’. Welcome to the future of live aboard diving! Nitrox was added to Horizon in the spring of 2003. Our membrane system was and is still on the cutting edge of Nitrox safety. No blending here, we pull the nitrogen out of the air to give you up to a 36% oxygen mix. The environmental outlook is bright, and we will continue to do our part to educate all of our guests of the responsibility that we must shoulder. We have one ocean, one planet we’re all stewards. We look forward to seeing you on board America’s Shark Boat!